Imagine having the foresight and putting in $200k into the stock. Today it would be world more than $1.5 million. That's the stuff that stock market dreams are made of. It is what that excites the public and keep people coming back to the stock market again and again. Today, we are going to study and learn how this stock went up so much. If it goes higher, it may soon give a return of 1000%. Many investors would have missed this stock but as the saying goes "There is nothing new under the sun". If this can happen to Pentamaster, it can also happen to some stock in the future. All we need to do is study the characteristics of this stock and what made it go up so much. I'm going to look at the lessons from a technical analysis point of view with a little touch of fundamentals. In case you are searching for Pentamaster in your US stock chart provider, you will not be able to get it. This stock is a Malaysian tech stock, a country in South East Asia just north of Singapore. That's where the Petronas Twin Towers are. It just goes to show that there is wealth to be made in any stock market in the world. Just because its listed somewhere in a small stock market in a far corner of the world, it does not mean that there's no money to be made there. Which is why nowadays many funds are focusing on other countries outside of the US. The chart above is the weekly chart of Pentamaster. The stock was around 0.57 in 2016 and by August 2017 it hit the 5.00 mark. Prices are in Malaysian Ringgit of course. How did the stock run up so much? Are there any signs that hinted to the bull run? We will attempt to answer the questions below. Let us revisit the year 2015 and 2016 and have a look at what the stock was doing. 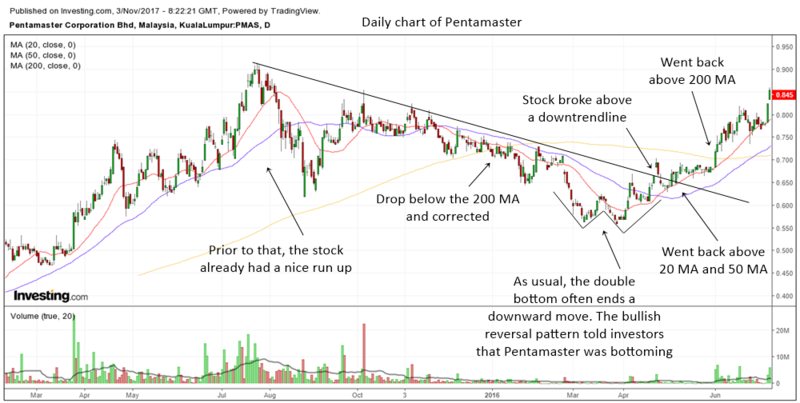 Below is a daily chart of Pentamaster in 2015 to 2016. The stock had a nice uptrend in 2015 up to August. Subsequently, the stock corrected and drifted lower and dropped below the 200 MA. Just when you thought that the stock will go lower, it started to form a double bottom pattern. To the observant trader or investor, the double bottom hinted of a possible bottoming in the stock. Whether you are an investor who uses fundamental analysis or technical analysis, it is a good idea to learn as many bullish reversal patterns as possible. All these pointed to the start of a new uptrend in Pentamaster. There are always early signs that tell the observant investor that a stock is bottoming. I have written about it in these articles and if you would like to know if a stock is bottoming you might want to check them out in your free time. How To Spot A Bottom In Stocks, How To Spot A Stock That Is About To Start An Uptrend. Let us now fast forward a bit to see the remaining of 2016 after the appearance of the double bottom chart pattern. 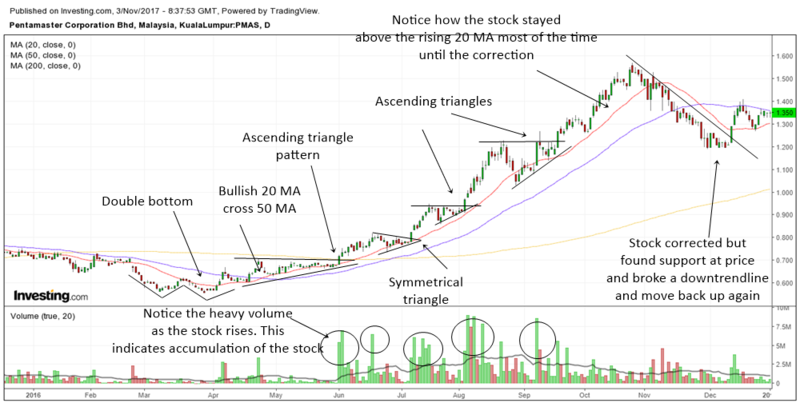 As you can see in the daily chart of Pentamaster below, the double bottom really did its work and started a new bull run in the stock for the rest of 2016. Only in November 2016 did it have a correction. There are so many things you can learn if you just pay attention and study history. Volume is a very important key in stock charts. When a stock is starting an uptrend and rising on heavy volume, it can often point to accumulation of the stock. Almost all stocks that have super bull runs will have unusual volume when they start a new uptrend. To learn more about volume and how they point to big winners, check out these articles. How Volume Affect Stocks, Supply And Demand, How Unusual Volume Ignites A Big Move In Stocks. Now that we have had a look at 2015 to 2016, let us fast forward to 2017 and witness how the stock had a super bull run. The chart above is the daily chart of Pentamaster for 2017. Notice how the correction at the end of 2016 was just a small bump in the road. After the correction, the stock made higher lows which is an early indication of the start of a new uptrend. The stock also traded back above the 20 MA and 50 MA and had a bullish 20 MA cross 50 MA. For the rest of the year, the stock continued to stay above the rising 20 MA and 50 MA. An indication of a very very bullish stock in the making. Whenever you see a stock above its rising 20 MA, 50 MA and 200 MA, it is always a sign of a bullish stock. By the way, I hope you also notice the unusual volume that forms in the stock as it starts the uptrend. The increase in volume and heavy volume spikes told us that the stock was being accumulated by investors. I just want to point out how Pentamaster became a very good swing trading candidate as well. Whenever you see a stock in a strong bullish uptrend, they will be the target of swing traders. I have been observing Pentamaster for quite some time and have found many swing trading setups that often appear in US stocks, appearing in Pentamaster as well. Those of you who have been swing trading for awhile will be able to recognize all these patterns albeit you might know it by a different name. I always like to look forward and see where the stock might go. It's all good to see from the past and learn but eventually you will need to start asking questions like: Where will this stock go? 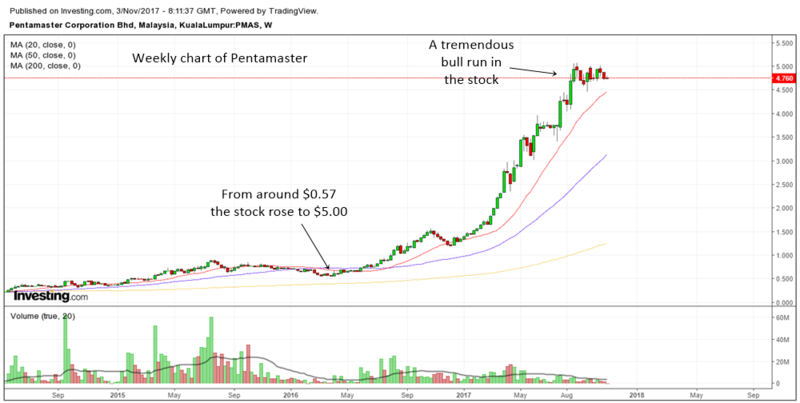 Currently, as we can see from the charts, Pentamaster has had a nice super bull run. It is not showing any weakness but we can say that it is trading sideways and resting. This is something that is very good to see in a healthy stock. If it was not healthy it will drop and crash isn't it? It might be forming an ascending triangle pattern or may be forming a long box type of consolidation. Doesn't really matter as long as it stays above 4.50, whatever it does is just a nice consolidation and we can consider it healthy. A break above the 5.00 area will most likely send it higher. I'm not a big fan of fundamental analysis. But there is some value in looking at financial ratios and stuff like that. Two things that you should pay big attention to is the earnings growth and the sales growth. The other important things are the Return on Equity, Return on Asset and Return on Investments. Basically, some of the William O'Neil stuff. 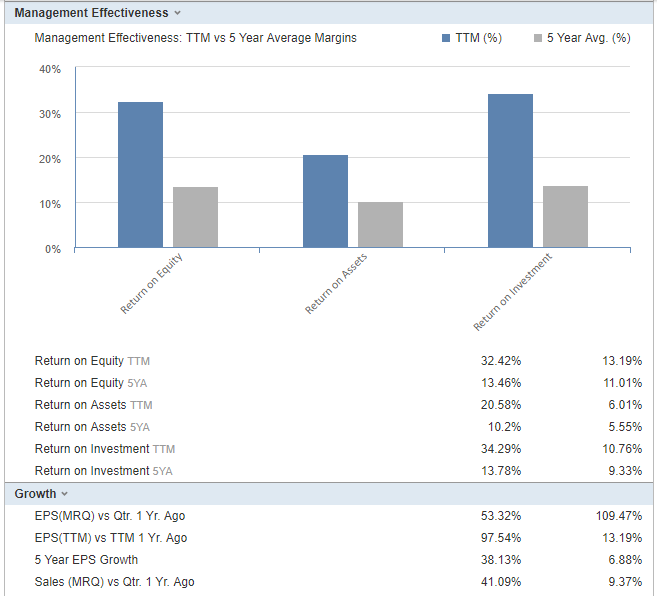 The above is a screenshot of some financial metrics of Pentamaster taken from Investing.com. As you can see, the ROE, ROA and ROI are all positive and good. The earnings per share growth is also positive. 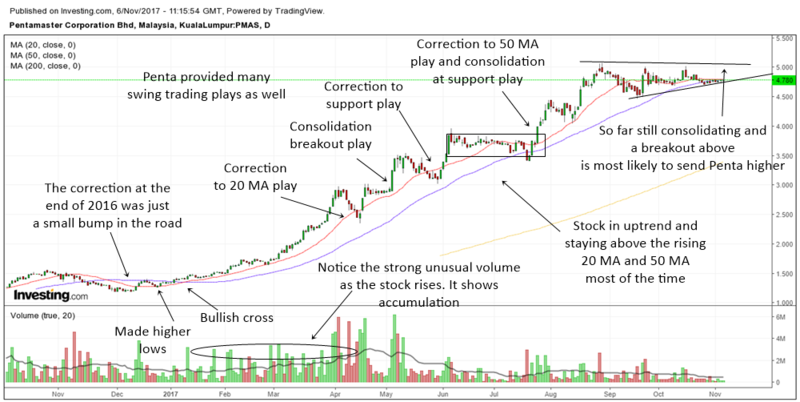 All these financial information coupled with some technical analysis points out to us that Pentamaster is a good stock to invest in. Sometimes the performance of a stock is closely tied to its sector. As you can see below, the Malaysian tech sector has been firing on all cylinders since the start of 2017. Which explains why many tech stocks in Malaysia have been going up and up and up. The top down approach to investing is to look at the main index and also the major sector indexes and try to find one whether it is in a super bullish mode. Then you zoom into the individual stocks to look for the mega winners. Notice how the Malaysian tech sector has been in an uptrend all the way. It has stayed above the rising 20 MA. 50 MA and 200 MA most of the time and this is a picture of super bullishness. 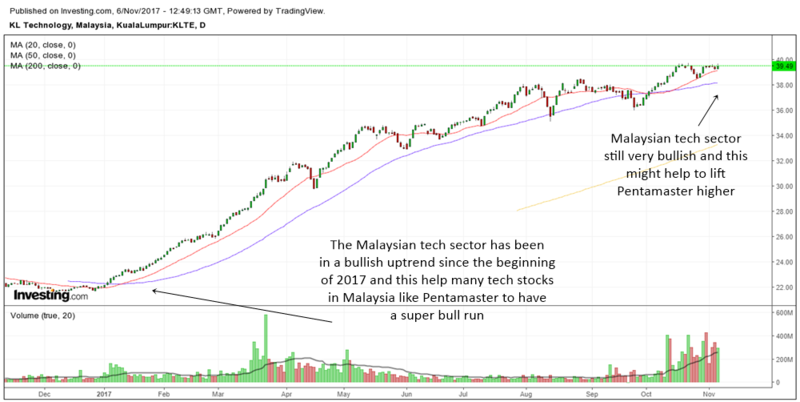 Currently I do not see any weakness yet in the Malaysian tech sector and if it continues to make higher highs and higher lows, it may well benefit Pentamaster as well as many uptrending Malaysian tech stocks. If you are investing in a tech stock, it is always a good idea to look at the biggest tech sector in the world which is the US technology sector. That's where the action is and what happens there will have a big impact on tech stocks around the world. The chart above is the daily chart of XLK which is the etf for the US tech sector. Notice how the tech sector had a tremendous bull run since January 2017. In a way, that also impacts the tech sectors in other countries. 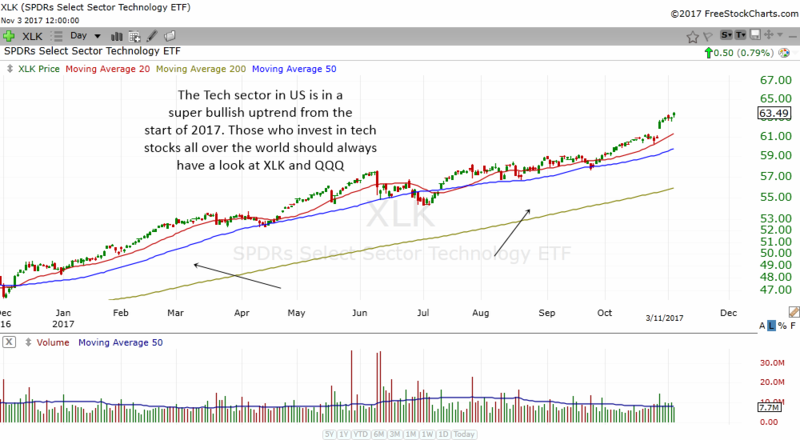 So, if you are a tech fan, I recommend that you always check out the chart of XLK, the QQQ (Nasdaq) and the SMH (semiconductors). If they are in an uptrend, it is very likely that many tech stocks in different countries will benefit from the rise. You can find success in the stock market around the world. Not only in America, but there are actually a lot of super bull runners in other countries. In the case of Pentamaster, it has enriched the coffers of many Malaysian investors and traders. There's always something to be learned from a stock that has risen a lot and I hope that this article has opened your eyes to the technical aspects of how a monster stock looks like before they shoot up.